Lordy. Summer’s here, apparently. At least, it is here in Manchester, a city noted less for its sun-drenched lazy afternoons, and more for simply being drenched in endless grey drizzle. So what better way to enhance sunny days than with some good music? 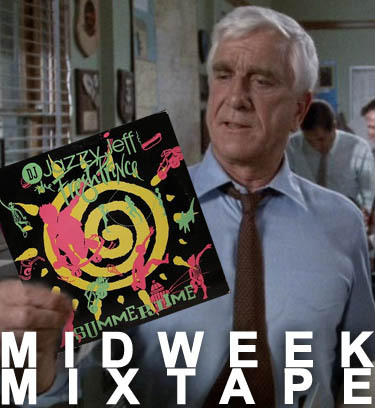 Lt. Drebin seems to think that pulling out some old ‘summer party classics’ is the correct response, and – hey! – maybe he’s right. FIRST! Dream Friends sound lazy. I mean that, of course, in the most positive way possible. Their songs seem to casually slump off their crunchy, humming guitars, and the microphones don’t seem to be bothered enough to capture the full fidelity of all the noises being produced. As such, Ageing Sports Star is a delightfully tactile triumph. SECOND! Ty Segall may or may not be a relation of flappy-handed chop-socky lunatic Steven Segal. He makes music, albeit of the cruddy, blues-lite kind. These Segalls’ rock is a bit bluesy, but mainly its slightly delerious, crashing, raw garage rock. Take that, Steven! THIRD! Now, I’m no expert (although you probably know that by now), but I’m sure that Le Gros Ballon translates to The Fat Balloon, a small detail that casts a shadow of absurdity over their very beautiful, dreamy songs. What’s Left Of Dreams is the kind of song you hear early in the morning whilst in a French bar, and leaves you in a bubble of strangely enjoyable melancholy. FINALLY! Miners Club have made a sort of cowboy sea-shanty in their song No Cash For Sorrow, which is a cross-genre category I never really considered before. Sometimes, gut-feeling chunk-rock is supremely satisfying, and it is the case here. A soundtrack to drunken nights. Posted on April 20, 2011 by Joe Sparrow. This entry was posted in Headline, Today's New Band. Bookmark the permalink.